How did you feel when you saw the Grenfell Tower fire tragedy in London in 2017? Shock? Horror? Disbelief? How could the fire have spread 19 floors from the fourth floor to the top in a mere 27 minutes and thereafter quickly engulfing the whole building? Yeoh, who is from the School of Mechanical and Manufacturing Engineering (MME), has been closely involved with Fire and Rescue NSW on collaborative research projects since 2005. His research has included the development of high fidelity fire models that have been used in criminal and forensic investigations. His work has also informed legislation change in sprinkler use in buildings in NSW and influenced the development of building codes and standards. He says the Grenfell tragedy is a big wakeup call and demonstrates the dire need for more fire materials research and fire modelling. This is why the brand new $4.3M ARC Training Centre in Fire Retardant Materials and Safety Technologies at UNSW is so vital and timely. Partnering with government, domestic and international companies, and universities, Yeoh says the purpose of the Training Centre is to create knowledge on green and durable fire-retardant materials, and advance fire models, fire suppression technologies, and new flammability tests for compliance with fire safety regulatory standards. The first thing on their list of things to do, says Yeoh, is mitigate the problem of flammable cladding. “Grenfell is not the only example of this type of fire. There have been a couple of similar fires in hotels in Dubai and there was a high-profile fire affecting the Melbourne Lacrosse Tower in 2015,” he says. We are putting the coating through its paces at the testing site at Fire and Rescue NSW NSW and think we’ll be able to take the product to market within the next 12 months. 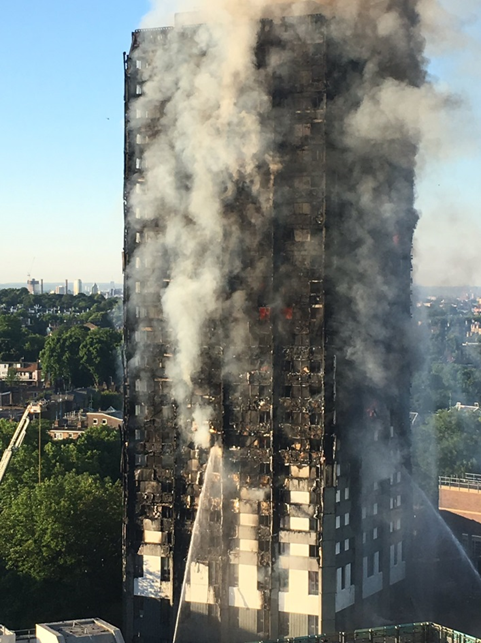 All these fires were accelerated by a type of external cladding that has been used extensively all over the world to better insulate buildings and make them more energy efficient. In NSW alone, over 1,000 buildings have been identified as being at risk from this cladding and Yeoh says that governments, fire experts, developers and manufacturers are worried. Yeoh and his team, who have recently inked an agreement with Flame Security International, are in the advanced stages of creating a fire-retardant coating that can be sprayed onto the cladding and will vastly reduce the speed at which a fire spreads. The coating, which Yeoh and his team are stringently testing for adhesion and water and UV resistance, will offer a cost-effective and durable coating which developers can apply and forget for three to five years. Flame Security International is an Australian-Swedish collaboration and the product is based on a formula that has already been developed for the Swedish market. Yeoh says their job is to improve the formulation for the Australian application and they are collaborating with colleagues from UNSW MME and Chemical Engineering to develop the product, which, it is hoped, will keep people safe and prevent further tragedies of this kind. “We are putting the coating through its paces at the testing site at Fire and Rescue NSW and think we’ll be able to take the product to market within the next 12 months,” Yeoh says.